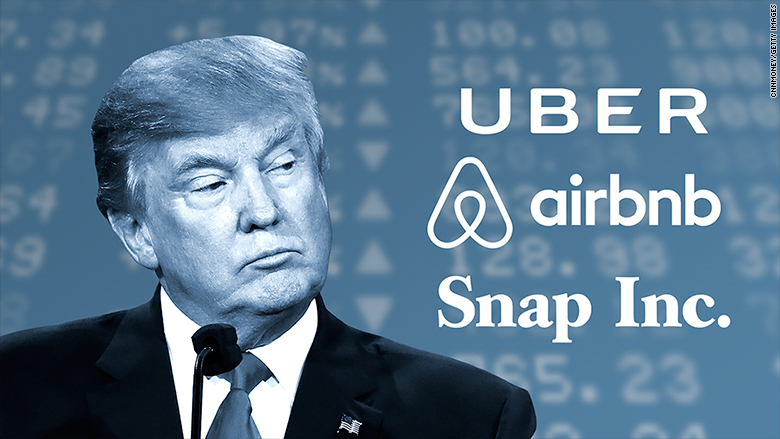 The dream of a tech IPO rebound may be on hold thanks to Donald Trump. Venture capitalists and IPO analysts say the tremendous amount of uncertainty around president-elect Trump and his policies could throw a wet blanket on tech startups looking to go public next year. "Risk in the marketplace does matter," says Lise Buyer, founder of Class V Group, which advises companies on public offerings. "We now have a president-elect who is a wild card as no one really knows where his practices and policies may take us." If that uncertainty doesn't abate, Buyer says, "the 2017 IPO market overlook could be much less promising." So far this year, just 19 tech companies have gone public, according to data from Renaissance Capital, which manages IPO-focused exchange-traded funds. That's down from 24 during the same period in 2015, which was the worst year since 2009. Even more striking: This year's tech IPOs are much smaller. Those 19 tech companies raised $3 billion from their initial public offerings, only half as much as tech companies raised during the same period last year. But the stars seemed aligned for a change. Wall Street investors showed a strong appetite for tech companies. The few startups that did go public this year, like Twilio (TWLO) and Nutanix (NTNX), were mostly trading above their IPO prices. And the market assumed Hillary Clinton was about to win, ending an acrimonious election cycle. "You had a really slow beginning of the year and then a real bottleneck created because companies didn't want to add the uncertainty of the election," says Saar Gur, a partner at Charles River Ventures, which invests in startups like Dropbox and ClassPass. Now the uncertainty about the election has been replaced with uncertainty about the next presidential administration "because there's such a lack of clarity," says Gur. The big publicly traded tech companies have already been forced to grapple with this uncertainty. Amazon (AMZN), Apple (AAPL), Google (GOOGL), Netflix (NFLX) and Facebook (FB) have all seen their stocks fall since the election despite an overall market surge, as investors weigh the icy relationship between Silicon Valley and Trump. Trump previously criticized Amazon and its CEO Jeff Bezos for having a "huge antitrust problem" and "getting away with murder tax-wise." He also threatened to boycott Apple over its encryption policy and pledged to make it "build their damn computers and things" in the U.S. rather than China. If Trump's administration takes an adversarial approach to the tech sector, that could hurt some of the biggest startups waiting in the wings. 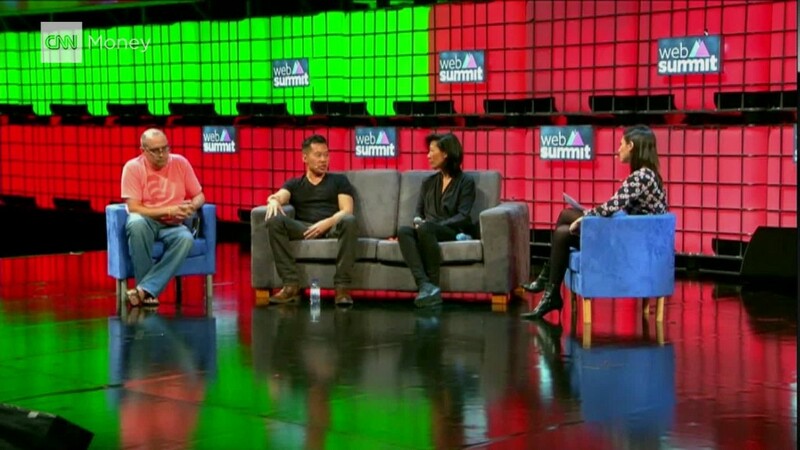 "The big market-cap companies like Airbnb and Uber are the ones that are facing a lot of regulatory scrutiny," says Gur. "Is Uber helpful to bringing jobs back to the Midwest or not? I don't know that we've heard Trump's opinion on that." However, Trump doesn't have to specifically go after the tech industry to disrupt tech IPOs. "The real risk is there's a lot of uncertain new policies and if they don't work to grow the economy, we are at a very risky time," says Kathleen Smith, principal at Renaissance Capital. "That hurts IPOs. The minute investors get spooked about having a slowown, they sell off these new stocks." Harry Weller, a venture capitalist at New Enterprise Associates, says the tech industry is staring at "a more volatile IPO window" that could shut "suddenly" depending on Trump's moves in office. In fact, Weller says he received texts and emails after the election from tech executives who are worried they need to raise money or go public now, while the stock market is still up, "before it's too late." "I think you will see some people try to make the window while it's still open," he says. "And right now, it's still open."